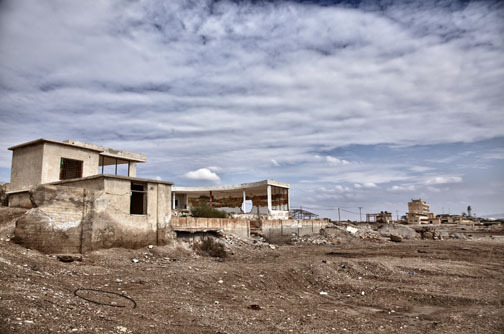 March 2011 – Decrepitude and Other Beautiful Images……. 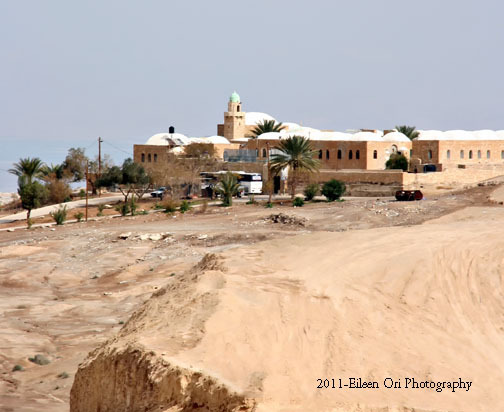 Eileen and I left Maqam Al Nabi Musa and headed south on Highway 1 towards our destination Ein Bokek and the Dead Sea. 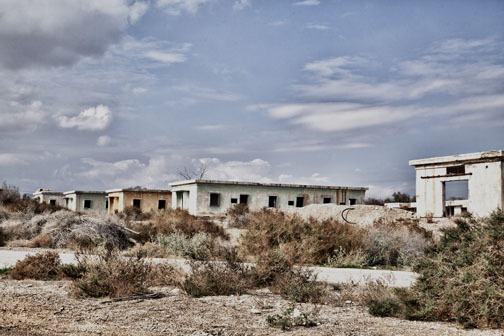 Driving along the highway we unexpectedly came upon the remains/ruins of the Palestine Potash Company an early settlement in the northern Dead Sea. 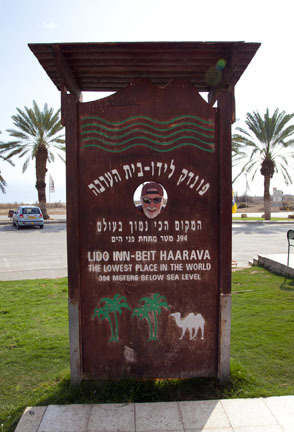 This intersection of Highway 1 and Highway 90 is known as the Beit HaArava Junction. 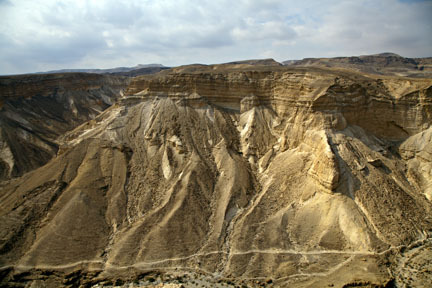 A company that extracted potash from the Dead Sea, the Palestine Potash Company was founded in 1929. 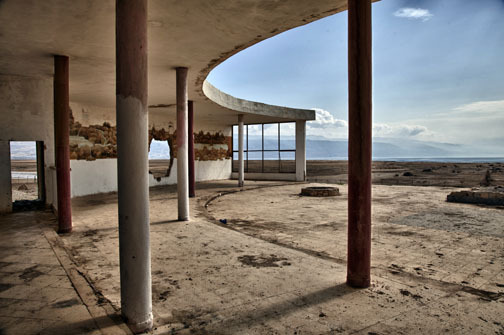 In 1930, a plant was established at Kalia, at the northern end of the Dead Sea. 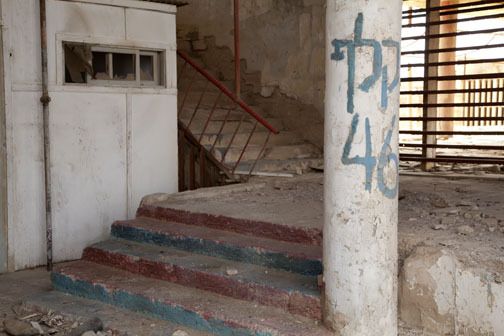 A year later the first Jewish settlement near Ein-Jaher, to the west of the factory was established. It included four buildings of three-story apartment units. 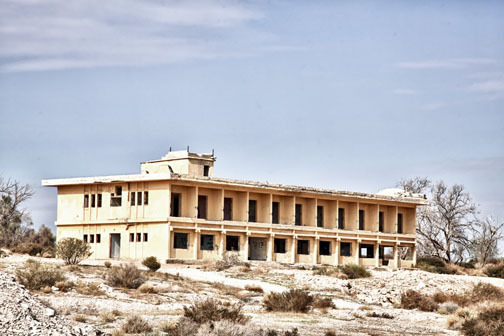 Close by the settlement was the Kaliya Hotel which was built as a recreation site for settlement officials and occasional tourists. 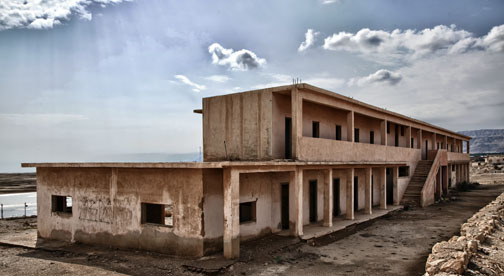 It was the first of the many hotels built along the Dead Sea which centered on the therapeutic properties of the sea. 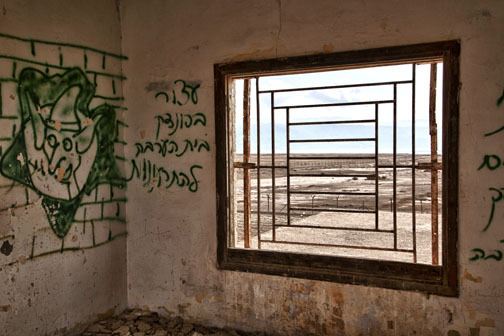 The village, located just south of the Potash Company, was originally established in 1939 by European members of Zionist youth movement groups who had fled Nazi Germany Palestine. 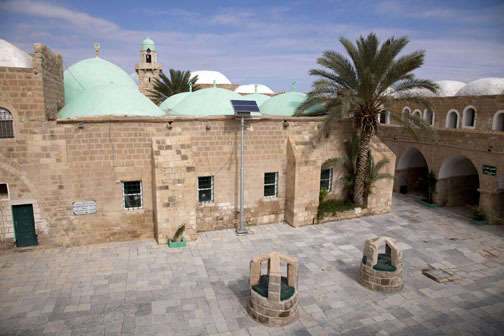 On 20 May 1948, after a failure to reach an agreement with then Transjordan’s King Abdullah, Beit HaArava was abandoned due to its isolation during the fighting of the 1948 Arab-Israeli War. 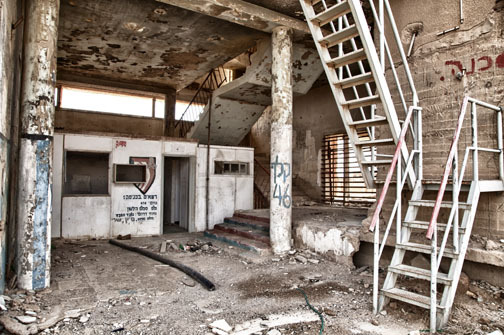 As we left Beit HaArava and headed south we came upon this abandoned building and wondered if Tony Sweet was getting ready to set up an Israeli branch. Is this Tony Sweet's new headquarters? 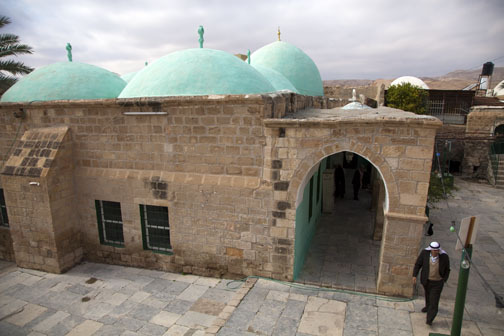 The maqam of Nabi Musa is considered a Muslim holy place because it houses the grave of prophet Moses according to local tradition. Moses is recognized by Muslims as one of the great prophets of Islam. 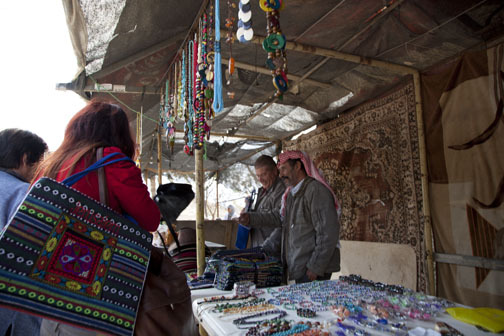 Muslims believe that Moses is buried here but according to the Old Testament, Moses never entered the Promised Land and is said to have died at Mount Nebo in what is now known as Jordan. 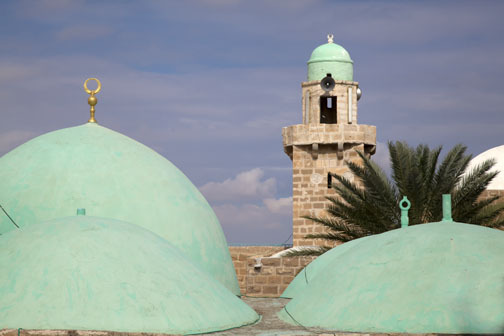 The maqam represents Islamic architecture in its simplest and best form. It is a large three story building topped by a complex of domes. 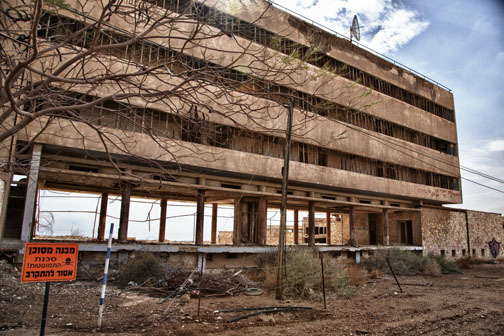 The building consists of a large central open courtyard surrounded by over 120 rooms and halls. 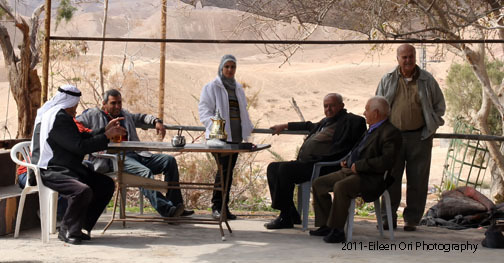 A Palestinian family from Jericho lives on the site and looks after it, they are happy to show visitors around. 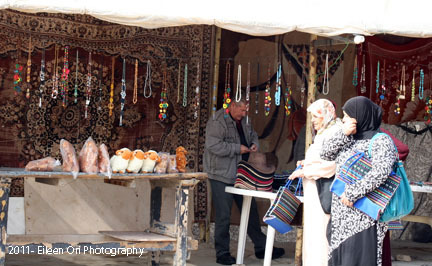 They run a small shop selling interesting and unusual gifts, such as pure olive-oil soap, honey and locally-produced olive oil, the proceeds of which go towards maintaining the site. Soft drinks and snacks are also available. 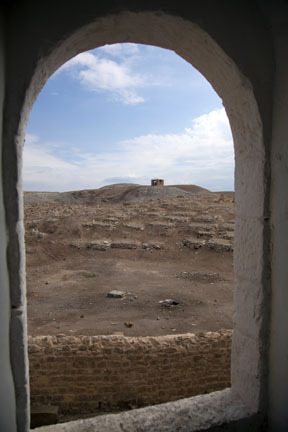 The huge cemetery outside the walls of the shrine as seen in the photograph below is for Muslims who either died during the festivals that are held here each year, or who asked to be buried here because of the sanctity of the site. Outside the mosque, Eileen captured a wonderful view of the shrine. 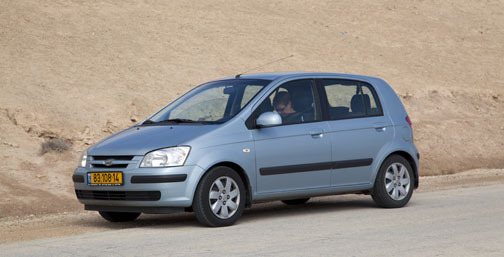 We contined on our journey heading further into the desert. 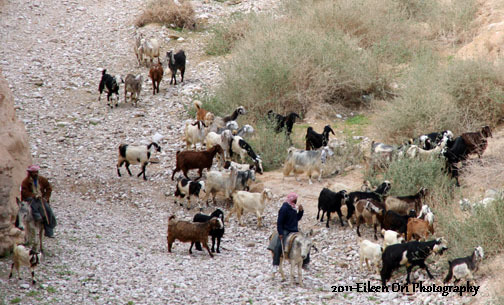 We passed over a small bridge above a dried out river bed which local Bedouins were found with their herd of goats. 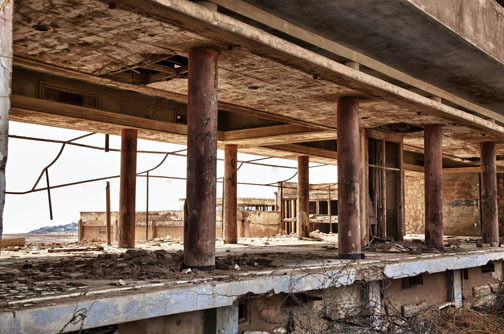 We drove on for a little while and came accross an abandoned building. 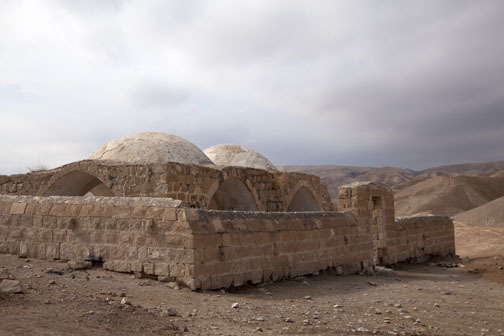 We later found out that this double-domed structure is identified by Muslim tradition as the Tomb of Hasan Al-Rai the shepherd of Moses. 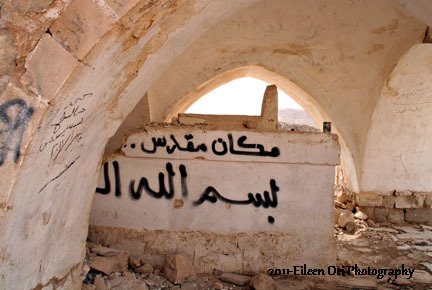 and the grave has been removed. 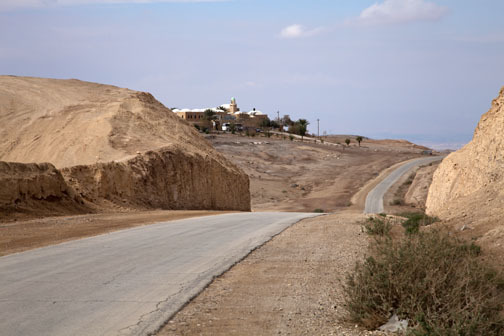 We decided it was time to head back to the main road and continue our journey to the Dead Sea. 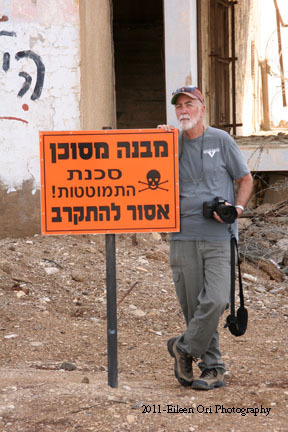 There is always something interesting to see in Israel. This trip has proven to be no exception. 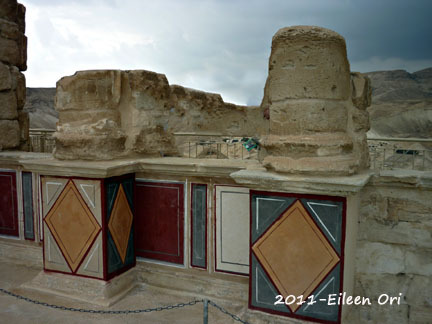 Masada is the name for a site of ancient palaces (Herod) and fortifications near the Dead Sea. 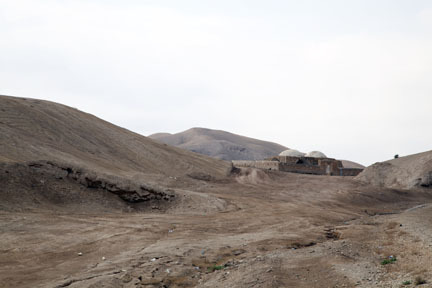 It is located on the top of a plateau on the edge of the Judean Desert. It’s historical significance for the Jewish people dates back to the First Jewish-Roman war when it was sieged by the troops of the Roman Empire leading to the mass suicide of the Jewish rebels that were living there. Instead we took the cable car. 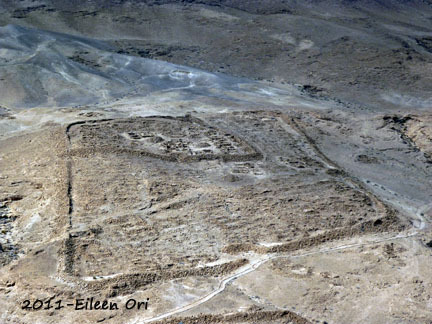 According to Josephus, a Jewish-Roman scholar from around 1 BC (it is his writings that we know most about Masada) Herod the Great fortified Masada between 37 and 31 BC as a hideout for himself in the event of a revolt. He built two palaces the Western and Northern. 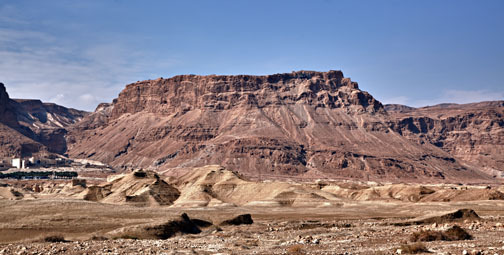 In 66 BC, at the beginning of the First Jewish-Roman War against the Roman Empire, a group of Jewish extremists called the Sicarii overcame the Romans at Masada. 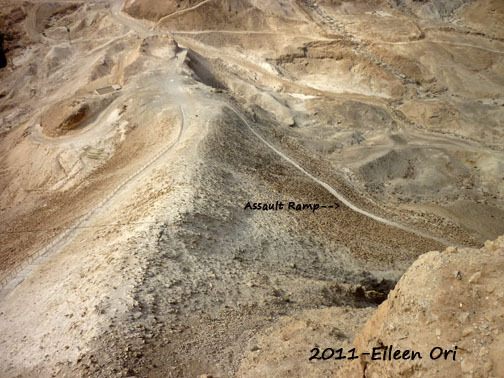 After the destruction of the Second Temple in Jerusalem additional members and their families fled Jerusalem settled on the mountaintop, using it as a base for harassing the Romans. The works of Josephus are the sole record of events that took place during the siege. According to modern interpretations of Josephus, the Sicarii were an extremist splinter group who were equally antagonistic to both Romans and other Jewish groups. 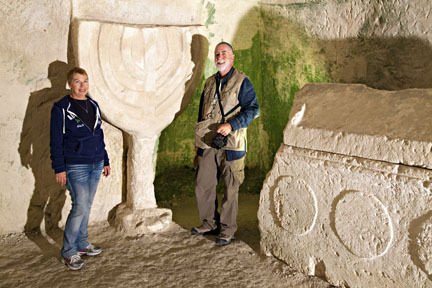 Archaeology indicates that they modified some of the structures they found there; this includes a building which was modified to function as a synagogue facing Jerusalem. 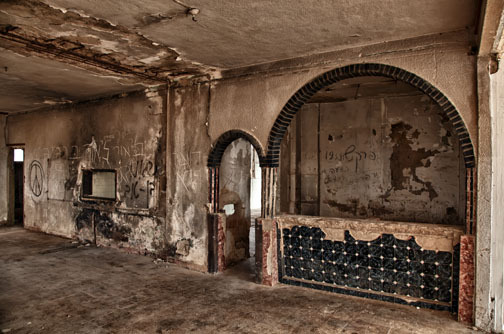 It is one of the oldest synagogues in Israel. 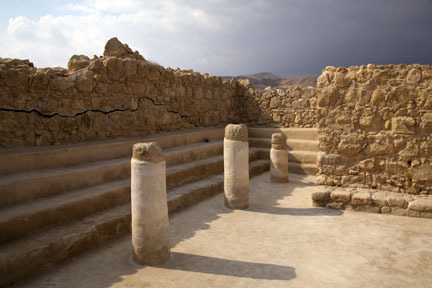 The remains of two mikvahs (ritual baths) were found elsewhere on Masada. and built a wall and then an embankment and an assault ramp against the western face of the plateau, moving thousands of tons of stones and beaten earth to do so. 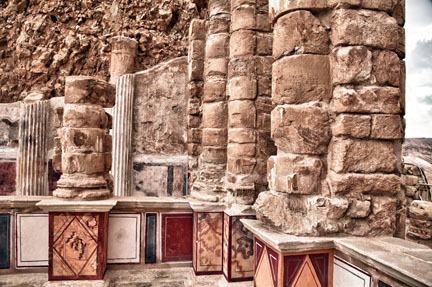 Some historians also believe that Romans may have used Jewish slaves to build the ramp. Josephus wrote about the siege based on the stories told by two women survivors who hid from the Romans inside a cistern along with five children prior to the mass suicide of the remaining rebels. Because Judaism strongly discourages suicide Josephus reported that the defenders had drawn lots and killed each other in turn, down to the last man, who would be the only one to actually take his own life. Josephus says that Eleazar ordered his men to destroy everything except the foodstuffs to show that the defenders retained the ability to live, and so chose their own death over slavery. 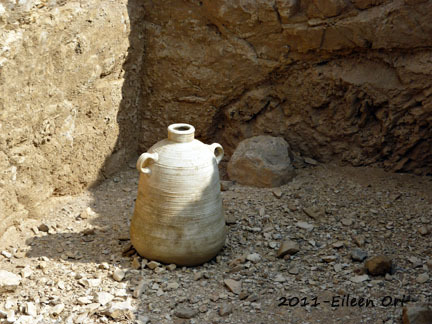 Eileen and I discovered and recorded many of the other things we found on Masada. 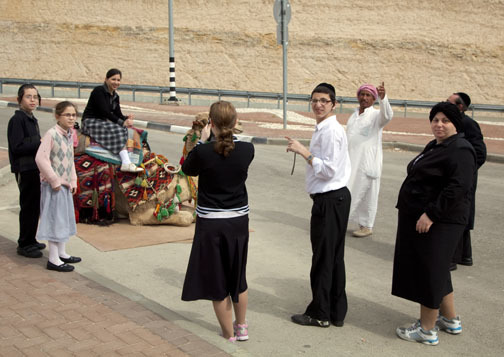 Now that we’ve settled in at home in Rockville Centre it’s time to share the rest of our journey in Israel. 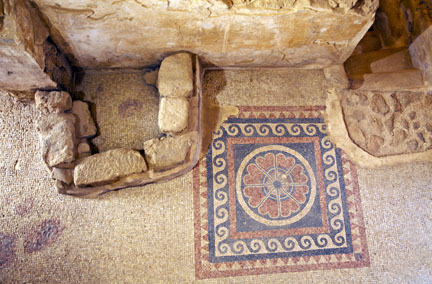 Located in the Galilee, Beit She’arim has some of the most dramatic and interesting evidence of the Jewish past in the Galilee and of the Jewish world dating back to Roman times. 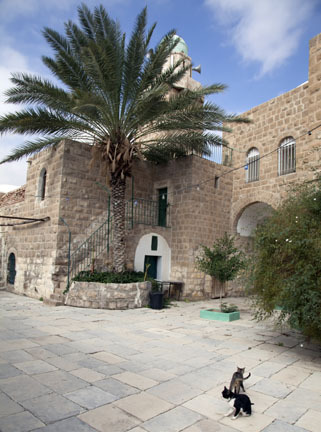 Bet Shearim was recently chosen as a protected site by the UN and is Israel’s equivalent of Petra. It is less pink and spectacular at first sight than Petra, but this burial ground (necropolis) of the ancient Jewish community is fascinating. Rabbi Judah HaNasi (135-217 CE), the compiler of the Mishna (Jewish laws), and the main authority for the Jews at that ime, lived here and established a Sanhedrin (council). 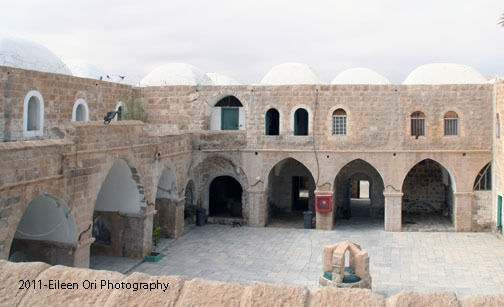 Beit She’arim became an alternative to the Mount of Olives in Jerusalem after the Roman emperor Hadrian had decreed that Jerusalem was off-bounds for Jews. 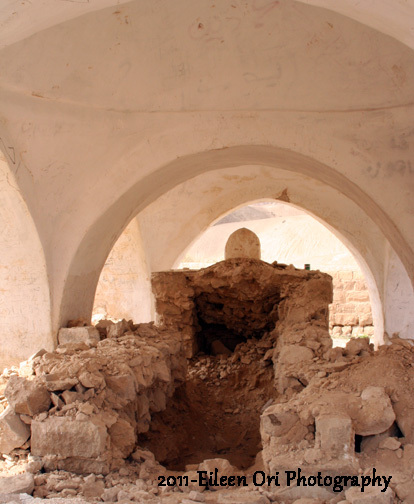 After Rabbi Judah’s death, Bet Shearim became the main site for Jewish burial in Palestine and the Diaspora, for a period of a hundred years. The graves were carved out in the rock, and so the city attracted workmen for quarrying, and for stone cutting and sculpting of the entrance doors to the caves, and the sarcophagi or coffins in which the bones of the dead were laid.